Valvular heart disease (VHD) is a condition caused by the breakdown and thickening of the valves of the heart. In order to understand the impact of this disease, we need to look at the anatomy of your cat’s heart. Your cat’s heart, like yours, is a four-chambered pump made of muscle. The valves of the heart work to keep blood flowing in the correct direction. Normally, blood moves first into the atrium, the pump primer. The atrium then contracts, pushing blood into the ventricle, which serves as the pump. Normal pump function requires that blood move always in this direction. 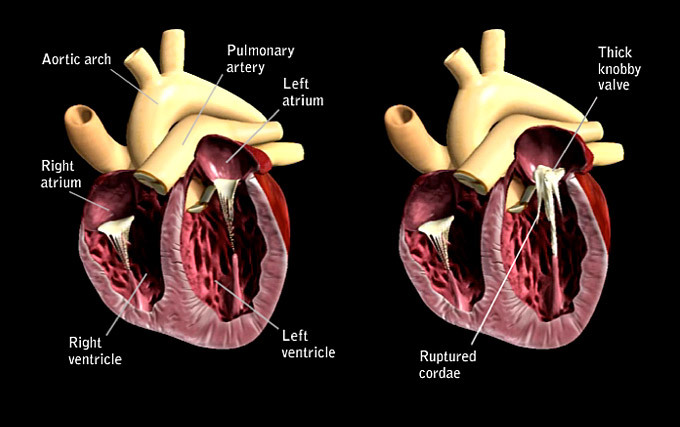 However, with VHD, degenerative changes in the valve between the atrium and the ventricle cause it to become thick and distorted. As a result, the edges don’t make a tight seal when the valve shuts and small amounts of blood leak from the ventricle into the atrium with each heartbeat. To compensate for this leaky valve, the heart has to pump more blood with each beat, causing the heart to enlarge over time. This extra workload causes the heart to become ineffective and unable to keep up with the body’s demand for blood flow. This inability to supply the body with the blood it needs is known as congestive heart failure. Unfortunately, in the early stages of heart disease, your cat’s body may make adjustments that allow him to cope with the disease. During this stage, your cat may show no visible signs of being sick. Unfortunately, VHD is a progressive disease that can’t be prevented. However, routine veterinary visits with your furry friend can help identify heart conditions such as VHD in their earliest stages. To learn more about feline heart disease, visit www.yourcatsheart.com.